The third child born to Washington Lafayette "Fate" Loftin and Margaret Jane Lackey was Other Frederick "Fred" Loftin. Fred was born 20 Jun 1886. There seems to be some discrepancy concerning Fred's first name. On his headstone at Center Methodist Church in Catawba, NC, his name is listed as Otho Frederick Loftin, but his Death Certificate, the Catawba County Vital Statistics Record for Deaths, and his WW1 Draft Registration card all list his name as Other Frederick Loftin. There is a "possibility" that "Other" was an incorrect spelling for the name "Arthur". Fred's siblings were Pearl Mabelle Loftin, Patrick H. Loftin and "Infant Son" Loftin". Fred married Nannie Elizabeth Lowarance, the daughter of Henry Durant Lowrance and Sarah Josephine Bost. Nannie was born 232 Nov 1883. Records indicate that Other Fred and Nannie Elizabeth had at least five children. *All records show Lafayette D. Loftin's name as "L.D." except for the 1940 Census. Even though this is only "one" document, it seems unusual that anyone would have told the census taker that his name was "Lafayette D." if they hadn't heard the name before. Fred registered for the draft on 12 September in Newton, NC. His Registration Card indicates that he was 32 years old, was tall, had black hair and blue eyes. His name is listed as "Other" Frederick Loftin. The 1900 Census shows Other Frederick "Fred" Loftin living with his parents Washington LaFayette "Fate" Loftin & Margaret Jane Lackey Loftin, in the Caldwell Township of Catawba County, NC. Fred's age was 14 and he was listed as a "Farm Laborer". The Census shows that his birth year is 1885 (which should be 1886) and that he was born in the month of June. 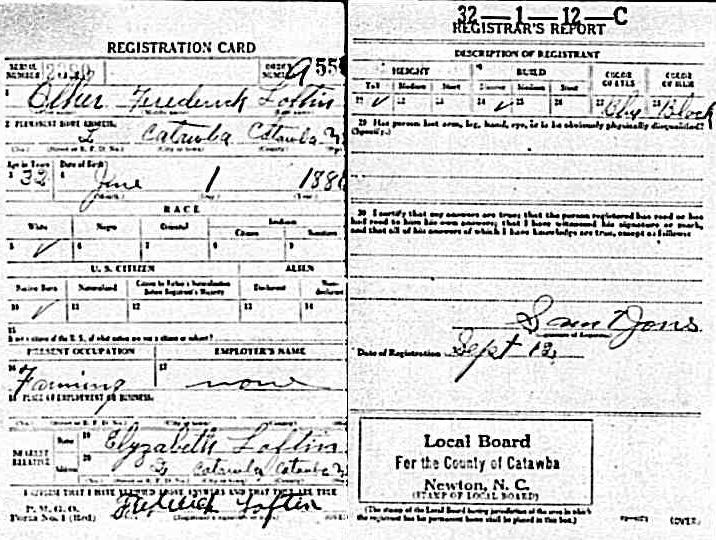 The 1920 Census shows Other Fred and Nannie Elizabeth living in the Caldwell Township of Catawba County, NC. The Census was "Enumerated" in February 1920. Fred was 34 and Nannie Elizabeth was 36. They had four of their children living on the family farm: Gladys E (spelled "Glattice E. by the Census taker), Olive Bliss (spelled Olliv), L. D., and an "Infant" daughter (this would have been Lola May who was born in December of 1919). Living next door to Fred was his parents, Fate & Margaret Loftin, and his sister Pearl Maybelle (spelled Perle M. by the Census taker). Pearl left later that year to serve as a missionary in Hong Kong, CHINA, for the Pentecostal Holiness Church. Her age was 38. The 1930 Census shows Other Fred and Nannie Elizabeth living in the Caldwell Township of Catawba County. He was 43 and working as a "Farmer". The Census shows that he owned his home and that the value was $4000. We learn that Fred was 19 years old when he wed Nannie Elizabeth and that she was 21 at the time. They have five of their children living with them in the home in 1930: Gladys (age 20), Olive (age 16), L.D. (age 12), Lola May (age 10) and Arthur Fred (age 7 years and 8 months). Other Fred's father, Washington LaFayette "Fate" Loftin, was living nearby. Fred's mother Margaret Jane Lackey Loftin had died on 27 Mar 1928 and Fate married Charlotte Caroline Drum. Fate owned his home and it was valued at $3000. Other Frederick Loftin died 14 Jan 1946 at 8:30 PM in Catawba, NC. Fred was 59 years old at the time of his death. 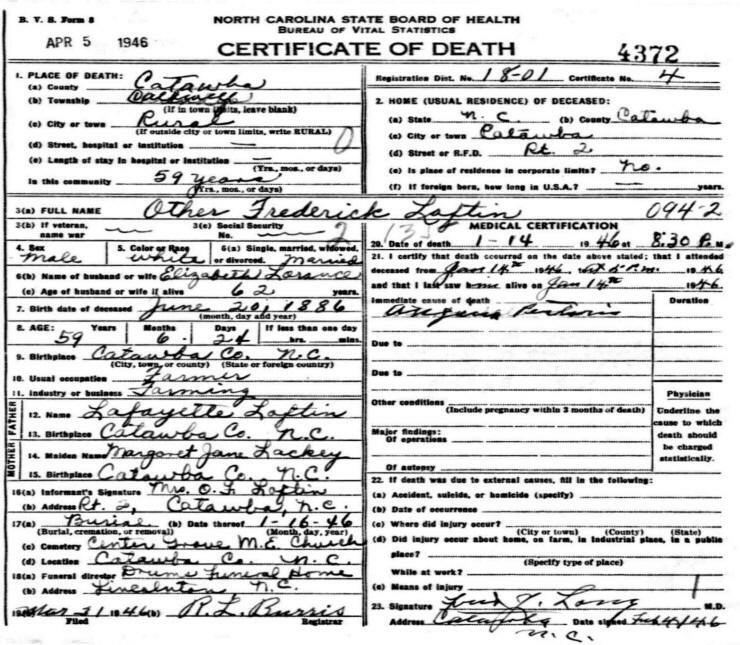 His Death Certificate lists his birth date (June 20, 1886), Father (Lafayette Loftin), Mother (Margaret Jane Lackey) and wife (Elizabeth Lowrance). His name is listed as "Other" Frederick Loftin. Fred was buried at Center Grove Methodist Church in Catawba County, NC. 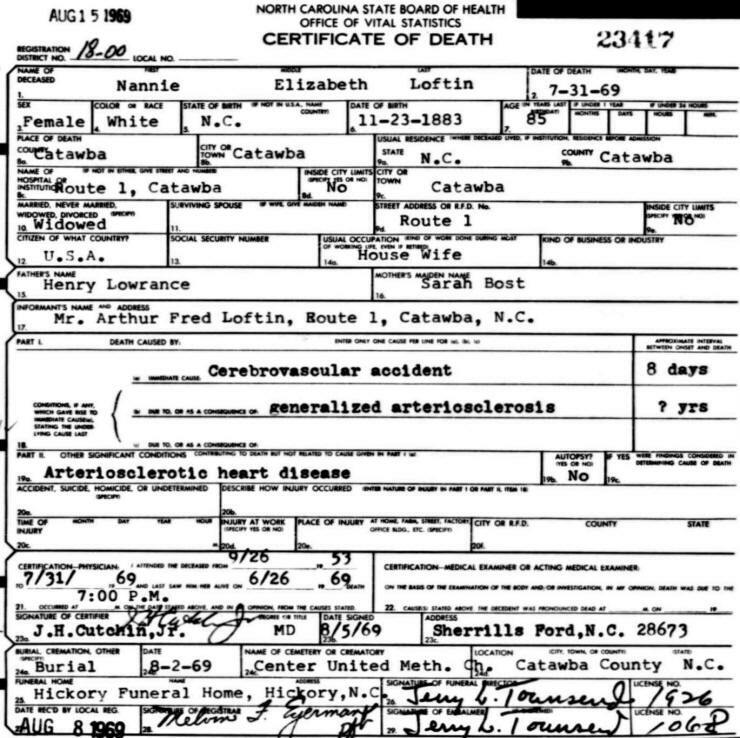 The Catawba County Vital Statistics & Deaths Index, Book 32, Page 14, also lists his name as "Other" Frederick Loftin, and shows that he was living in the Caldwell Township of Catawba County, NC. Nannie Elizabeth Lowrance Loftin died 31 Jul 1969 at the age of 85 years old. Her Death Certificate lists her birth date as (11-23-1883), Father (Henry Lowrance) and Mother (Sarah Bost). The cause of death was "Cerebrovascular accident" (Stroke) complicated by "Arteriosclerotis heart disease" (Hardening of the Arteries). The informant was her son, Arthur Fred Loftin. Other Frederick "Fred" Loftin and Nannie Elizabeth Lowrance Loftin were buried at Center Methodist Church, Catawba, Catawba County, NC.